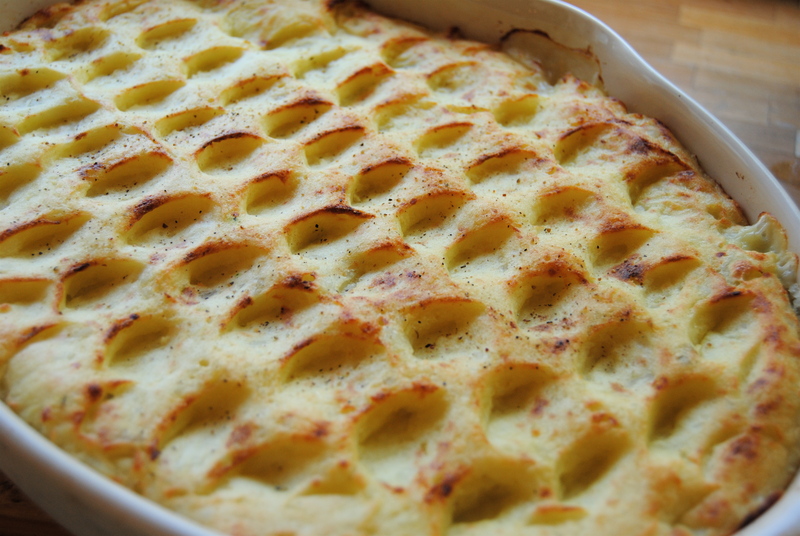 If you are swanning about in short sleeves – or Heaven forfend, a tank top – you may think it a bit odd offering something as defiantly wintry as a fish pie. But if you live in the UK, especially Scotland, the weather today is about as summery as a fur coat. 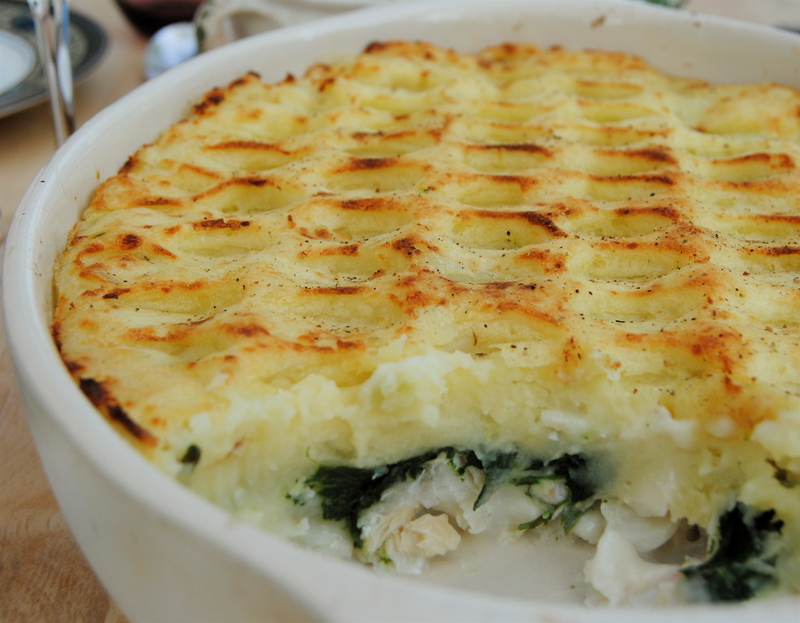 So fish pie it is. And, I did promise last week to give you a bit of familiar comfort. Not being possessed of wild imagination I can think of nothing more duvet-like and comfy cosy than tender flaky fish and decadent scented white sauce, all blanketed in yielding but slightly butter-crisped mashed potato. Ohh, I’m getting hungry just typing this. Must concentrate and ignore leftovers nestled snugly in their easy-view glass dish. As this is supposed to be a healthy food blog I feel obliged to inject at least a little greenery into proceedings. That’s where the spinach comes in. Don’t go urgh, it’s actually extremely nice and makes a subtle counterpoint to the rather luxurious (for me anyway) sauce. If you truly hate spinach give it a miss but the minerally bite is worth the extra step. Peppery, seasonal watercress would be good too. Speaking of extra steps, this is not a dish to be hurried, either in the making or the eating. It is by no stretch of the imagination difficult but there are a few steps more than my usual recipes, and a bit more washing up. I encourage you to enlist someone else to do the latter as down-payment for having a Himalayan portion of pie. Being a simple dish without the hiding space of spice or heat, the fish you use is fairly crucial. If possible try to get MSC certified or sustainable fish for the feel-food factor, but also the usually superior taste and texture. Fishmongers and visiting fish vans tend to give us the best fish for price and quality but some UK supermarkets have a creditable selection (I’m thinking of Morrison’s and Waitrose). We like haddock as it is easy to get a matching mildly smoked piece, but under-rated coley and hake would be good, and a good deal cheaper. And please, please don’t chuck away the bay-scented milky poaching liquor; it is integral to the final flavour and would be sadly missed if absent-mindedly condemned to join the coffee grounds and other micro-swill down the drain. Nutrition Notes: Fish is referred to as rich food for poor people, being readily available in many countries where protein-poor rice or cassava are staple foods. Being 18-20% protein on a fresh-weight basis, fish varies more greatly in its fat content, but it’s nearly all heart-healthy stuff. Fish is so good for us that most western governments recommend at least two servings a week, one being oily. Fish is also a great choice if you are undergoing treatment for cancer. 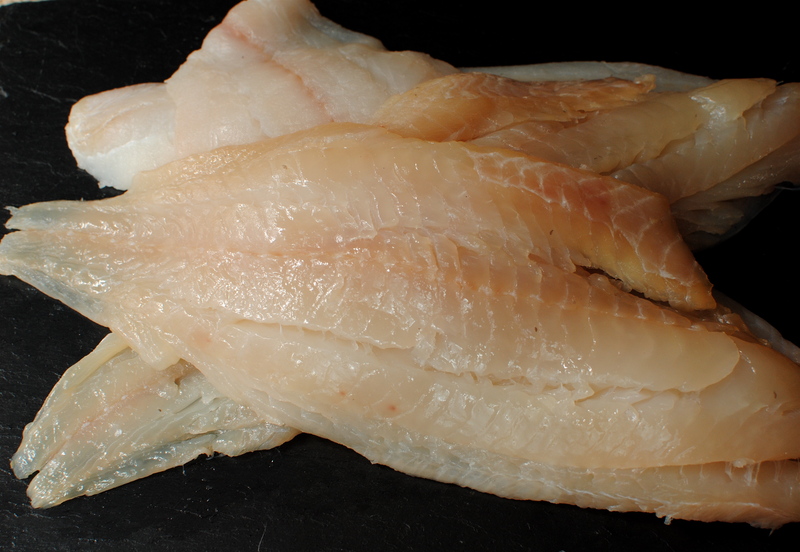 It is easier to digest than most other protein options and is certainly quick to cook – about 10 minutes per inch thickness, a lot less for thin fillets of delicate lemon sole or robust mackerel. Unless you are tackling a whole salmon fish rarely takes more than 20 minutes, regardless of cooking method. All fish will contain the same impressive array of vitamins and minerals, but in varying amounts depending on type. The stand out nutrients are vitamins A and D, calcium, zinc, iodine, phosphorus and selenium. Zinc and selenium are sometimes tricky to get enough of so eating fish regularly is one habit worth taking up. These two nutrients are particularly important for cancer recovery. Zinc is not only crucial for optimum immune functioning but also helps the hair and skin – two things that get knocked for six during chemotherapy. 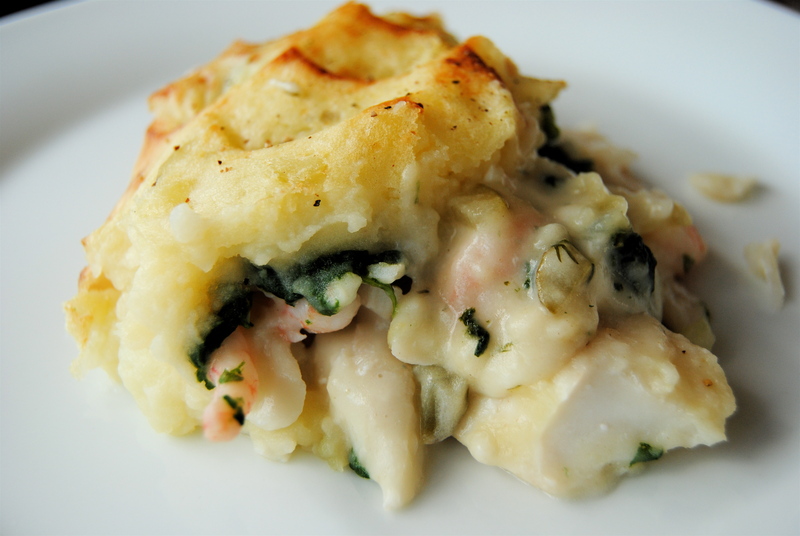 Many home cooks have an old and trusted fish pie recipe. It is one of those dishes that is not only family-friendly but also guest-friendly too. 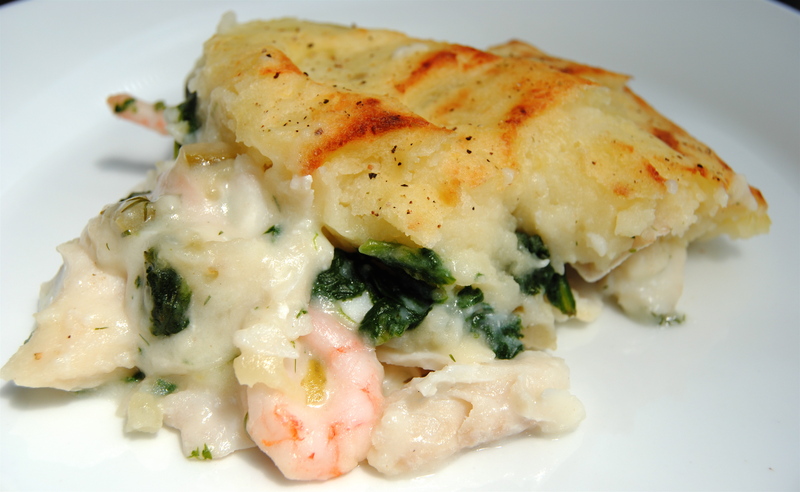 I can’t think of many people who would turn up their noses at a home-cooked fish pie. All you need to go with the pie is a big bowl of peas – and a big serving spoon. quantity of dry-ish mashed potatoes to cover area of the pie dish at a depth of about one inch. I use 1.5 kg of raw weight potatoes for my 2.5 litre volume dish. None of this has to be exact. 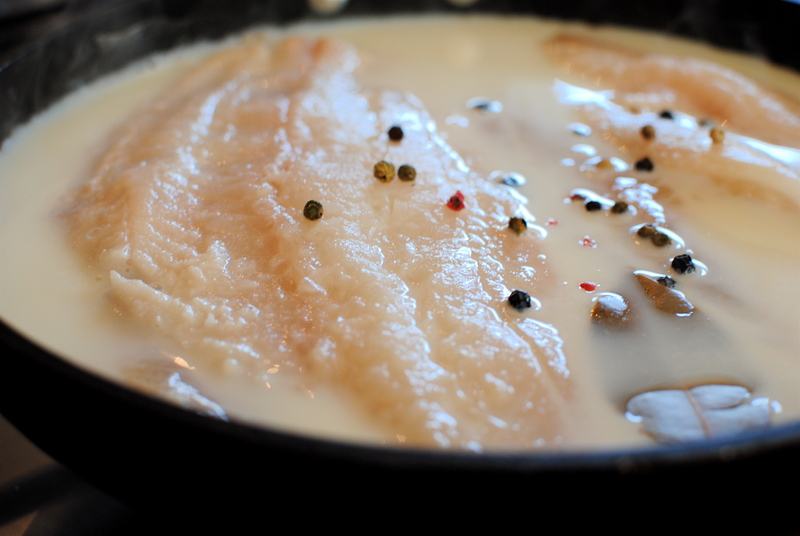 Put the fish in a large frying pan and cover with the milk (may need to do this in two batches); add the bay leaves and peppercorns. Slowly bring to the boil, cover and simmer gently for about 5 minutes. If it’s done the fish should flake easily. 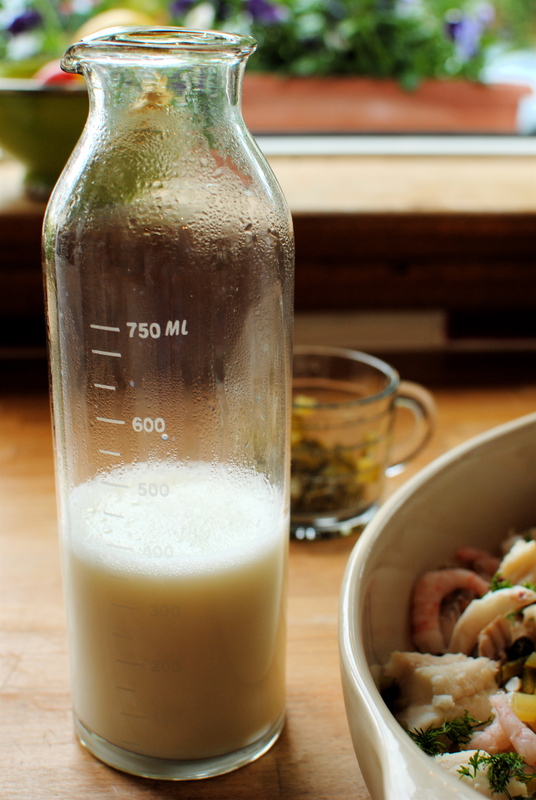 Strain off the milk into a measuring jug and allow the fish to cool in the strainer until you are able to handle it (discarding any bones, bay leaves, peppercorns and skin). I tend to rummage through the fish hunting out any stray bones with a pair of dedicated tweezers. 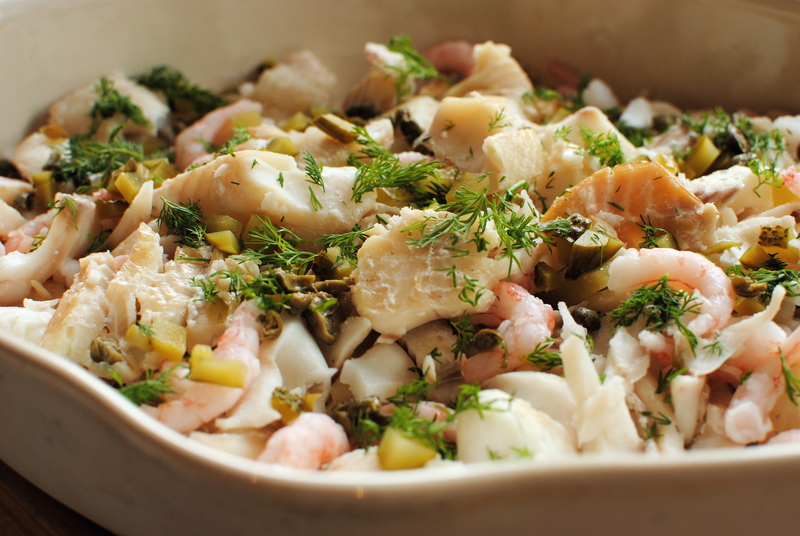 Flake the fish into nice sized chunks and add to your baking dish (approx 11 x 14 inches, or thereabouts), along with the prawns, capers, gherkins, parsley and dill, spinach and lemon juice. Give it a gentle mix. Leave to cool for a bit. Next, melt the butter in a saucepan and stir in the flour, and Old Bay if using. Cook, stirring constantly so it doesn’t stick and burn, for about two minutes on a medium heat, then very gradually add 400 ml of the fish milk, stirring all the time with a narrow whisk or wooden spoon. Bring the sauce to a gentle simmer, and cook gently for 3 minutes, stirring occasionally. If it’s a bit lumpy press it through a sieve or beat like heck in a small bowl. Pour the sauce onto the fish, seasoning if needed. 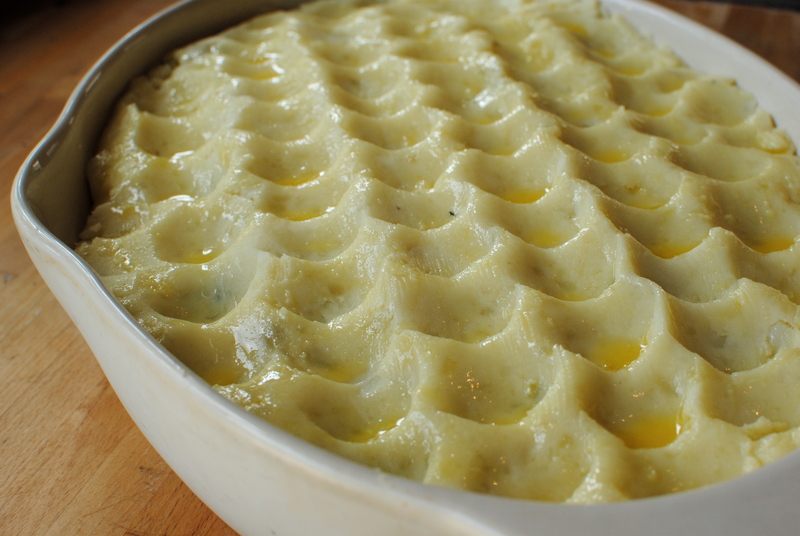 When the fish mix is cooled spoon on the mashed potato, starting at the edges of the dish and working inwards. Rough up the surface or press a tablespoon up and down into the mash in lines to form ‘scales’. Brush with melted butter if you like (makes a nice colour and texture). Bake at 350 for about 35 minutes or until the pie is bubbling at the edges and the mash is lightly browned. I often pop it under a hot grill to get crispy potato edges without overcooking the fish. Serves 6-8 (recipe is easily halved – we’re just greedy and love leftovers). * Old Bay is widely used in America for New England-style crab boils and crabcakes. In the UK you can sometimes get it in delis that stock American products. 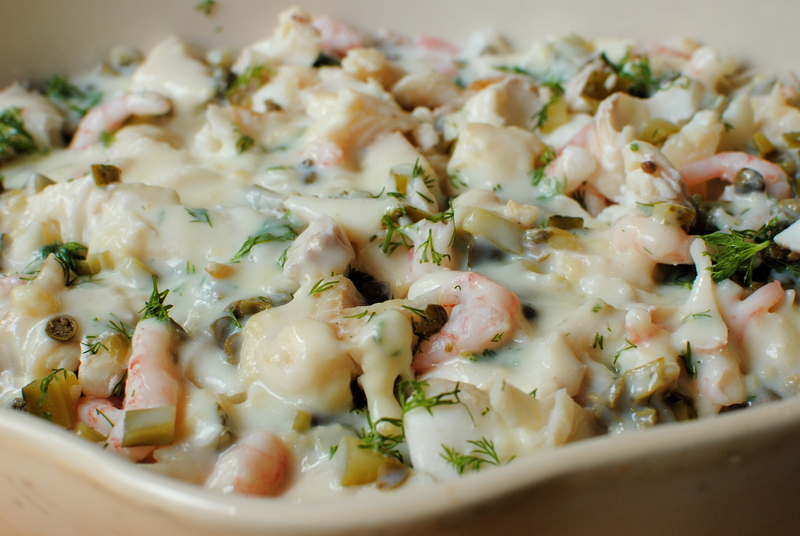 Note 1: You can make this with a mixture of salmon and white fish too. Top with mashed sweet potato for a colourful difference. Note 2: You can miss out the béchamel altogether and use a tub of crème fraiche (about 400 ml) and some of the poaching milk. Oh how delicious! Definitely one for next Autumn. Pretty much any time but high summer is time for fish pie 😀 Glad you found it & I hope you enjoy it- comforting but fresh-tasting & healthy.